Picture of a line to Tretyakov gallery taken on January 21. Visitors spend up to 4.5 hours in line in -14 degree temperatures (7 F) to see the famous artist’s exhibition. Valentin Serov is considered to be an iconic Russian artist and a rare exhibition of his paintings at a branch of the Tretyakov Gallery in Moscow recently attracted large and rowdy crowds. Sunday January 24 will be the last day of the exhibition, so the lines near the gallery have become increasingly long and anxious. On January 21 the crowd became so excited that it broke down the door to the exhibition hall. 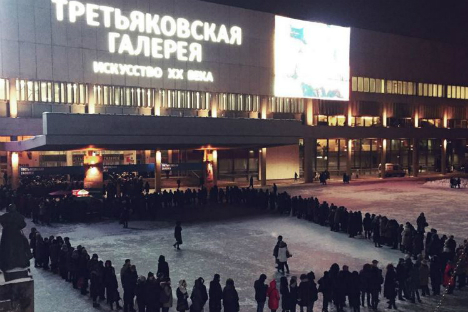 “The queue for [the] Serov [exhibition] looks like hell,” tweeted Meduza correspondent Ilya Azar on Wednesday. “People broke down one door by crowding in, women are screaming, everybody in another line yells ‘O-pen-doors!’ ”. The real crush began after some people managed to get inside. To calm down the crowd, gallery employees called the police reported the Dozhd TV channel. Law enforcement officers arrived, but no one was detained. After the incident, the Tretyakov Gallery administration decided to increase security and to stop selling online tickets. The exhibition of the Russian painter Valentin Serov commemorates the artist’s 150th birthday. It opened on October 7, 2015 and its last day will be January 24, 2016. As Russian media reported previously, huge crowds also assembled at the museum entrance during the winter holidays. Eyewitnesses told Dozhd that they waited up to 4.5 hours in the -14 degree temperatures to gain admission to the exhibit.